A gift of piano lessons makes an ideal birthday, anniversary or Christmas present. 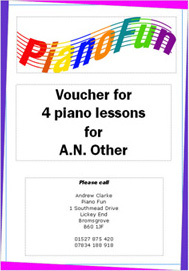 You can purchase a Gift Voucher for piano lessons online, or by calling 07834 188 918. A special message can be included on the Gift Voucher if required. Please call to check lesson availability before ordering. If you wish to purchase online then please select one of the following. You may pay by PayPal account, or by using your credit or debit card. Vouchers are created individually and then posted to you. Vouchers can be tailored for a different number of lessons to suit your needs. Please call to discuss. Buy a voucher online for 4 x 45 minute lessons (£108.00) and first piano book (£10.00) total £118.00. Please complete the following fields and then click the button below to purchase. 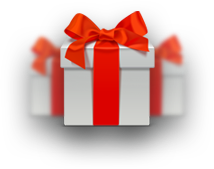 A voucher will be individually posted to you within 24 hours. Kindly note that vouchers are non-refundable and lessons must be started within 6 months of purchase. Please fill the following form and then click Buy Now. All fields are mandatory.